Since the late 1800s, people have enjoyed the peninsula for its recreational opportunities. Except for the limited private land, most of peninsula was the property of the federal government that still maintained it, at least on paper, as a lighthouse reserve. People started coming to the peninsula for chance to get back to nature along the shore of Lake Ontario. Early access was primarily by boat and the opening of the Murray Canal in 1889 increased traffic to Presqu'ile's shores. Regular ferry services ran to the Government Dock from many ports including Toronto and Rochester, in New York State. Summer camps, which started as canvas tents but by the turn of the century were as often simple framed buildings, were established along the protected shore of Presqu'ile Bay. These were set up, either by making arrangements with private land owners or by just building on crown land. In 1905 cottage lots were officially surveyed. 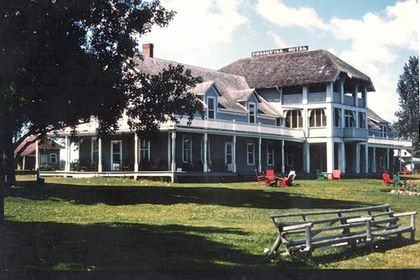 Also in 1905, the Presqu'ile Hotel, along with a dancing pavilion, was built by Peter Covell. Grant Quick purchased the hotel in 1916 and ran it until its closing and demolition in 1971. 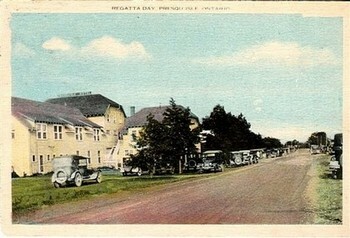 The hotel became the focus for many recreational activities, including annual regattas, service club and church picnics and gatherings, and of course dances every Saturday night at the pavilion. When the federal government transferred most of its land on the peninsula to the province in 1920 residents of Brighton and cottage owners were quick to propose a special authority be set up to supervise public and private land use at Presqu'ile. In 1922 the Presqu'ile Park Commission was established to do just that and Presqu'ile, in effect, became the 5th provincial park established in the province. With the commission came a number of improvements, including a decent access road, which opened up the park to a whole new and growing group of users. Official Provincial Park status did not come until after the passing of the Provincial Parks Act by the province in 1954 and Presqu'ile's management was transferred from the private Park Commission to the province on January 1st 1956. As a provincial park Presqu'ile began to take on the shape we see today. The cottage strip on the east side of the park, along Presqu'ile Bay was transferred to the Municipality of Brighton and during the 1960s and 70s most of the cottages there were transformed into year-round residences. Cottage leases along the western side of the park were cancelled and the cottages removed. Roads and campgrounds were built in their place and the old lighthouse keeper's cottage was expanded and turned into a visitor centre. Since 2000, the number of annual visitors to Presqu'ile has been in between 200,000 and 250,000.